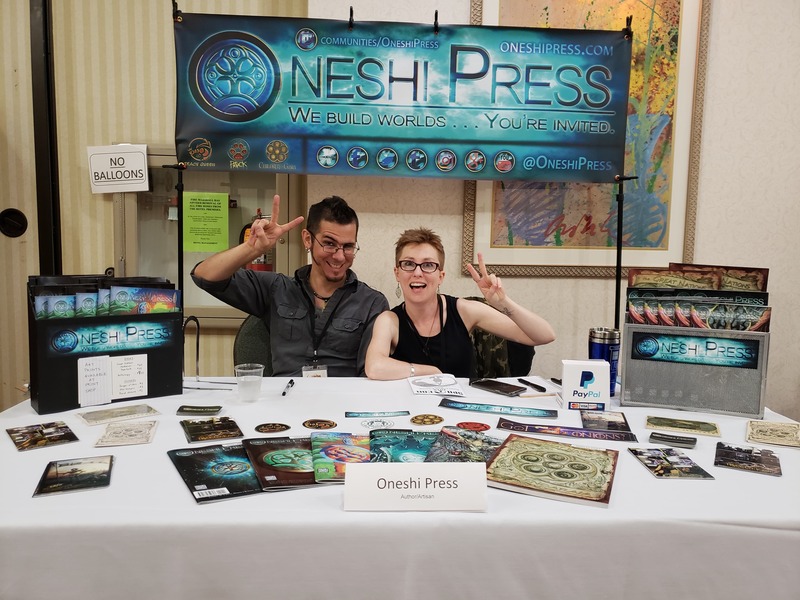 Jayel Draco and Lynsey G., ever so excited to be repping Oneshi Press at SpoCon 2018. SpoCon 2018 has come and gone, and Oneshi Press was there to witness its glory! We had an absolutely lovely time at Spokane, Washinton’s local SciFi and Fantasy Convention. We met some wonderful folks, plied our books, stickers and cards at the Oneshi Press booth. Also, we showed off Jayel Draco’s art in the annual Art Show; his digital painting “Alay’Otu’s Refugees,” even won the Art Chairman’s Award! Our dear friends and co-creators, Chris Covelli and Laure Bersig, came the whole way from Vancouver to help out with the booth, so that Lynsey and Jayel could run off to the many panels on which they sat over the weekend. We did some karaoke, played some Cards Against Humanity, and generally enjoyed the heck out of ourselves. We’ll have some video from the “Children of Gaia” panel ASAP, but we’ve got to edit it first. But in the meantime, here are some photos—and one video—from our wonderful weekend! James Humble, Grivante, and Jayel Draco on the “Strange New Worlds” panel at SpoCon 2018. Jayel Draco hanging his art in the SpoCon 2018 Art Show. The Oneshi Press table spread! Our new friend Kristen, rocking her “TarMucks” cup. Our thanks go out to the wonderful folks at SpoCon who made the weekend so much fun for us and everyone else who attended. We can’t wait to see you all again next year!